Preprocessed T4 templates generate all the code you need to execute a template at runtime. You can do the same "preprocessing" with Razor, but it takes a little more work. 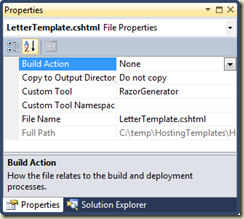 The first step is creating a custom tool for Visual Studio. Visual Studio will feed the template into this tool and expect you to generate the contents of a code file to include in the compilation phase of a project. Visual Studio communicates with the tool using the IVsSingleFileGenerator interface. Hungarian naming - yuck, but when in COM interop, do as the Hungarians do. The above class goes into a strong named assembly that you'll GAC and regasm. You also need to make a registry key under HKEY_LOCAL_MACHINE -> SOFTWARE -> Wow6432Node -> Microsoft -> VisualStudio -> 10.0 -> Generators (omit the Wow part on 32 bit systems). Dmitri Nesteruk has a good overview of the process in Custom Tools Explained. you, @Model.FirstName, that we will try harder. FirstName = "...", ShowNumber = "..."
Not as simple as Preprocessed T4 templates, but you can work with the vastly superior Razor syntax. In addition, there is no mucking around with appdomains and runtime compilation. 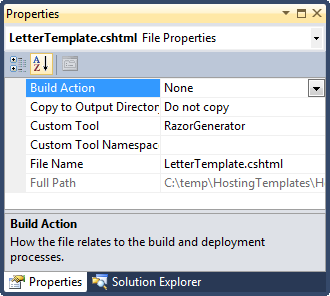 Instead, razor generates the C# code to compile into your project. get rid of the hugarian naming crap - it's terrible. Its not actually hungarian. It's the notation denoted as hungarian. The original notation had quite a different intent.